A key component in waste heat recovery is the heat exchanger. The profitability of an investment in waste heat recovery depends heavily on the efficiency of heat exchangers and their associated life cycle costs (purchase, maintenance, etc). All these factors vary considerably between different heat exchanger technologies. Although compact heat exchangers are very common in the process industry today, shell-and-tube heat exchangers are still dominating. These arguments are especially true for heat recovery services where the differences are maximal. The choice of heat exchanger is very important and has a direct impact on the bottom-line result. In fact, replacing old shell-and-tubes with new compact heat exchangers in existing heat recovery systems is often a very good investment, thanks to the strong benefits. In 2011, Alfa Laval compared the heat recovery per invested dollar of an AlfaNova compact heat exchanger with that of a BEM type shell-and-tube with stainless steel tubes and stainless-steel-cladded tube sheets. The initial values for the simulation were specifications from an existing condensate-stripper-tower interchanger. The temperature approach was gradually decreased in the simulation and the maximum amount of transferable heat between the two streams was indicated. The results show that the yield from the AlfaNova is up to 25% higher than for the shell-and-tube at a comparable cost, cf. the diagram. 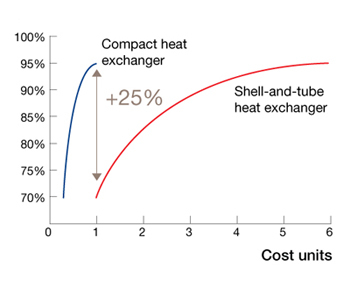 To reach the same levels of heat recovery the shell-and-tube becomes several times more expensive. Compact heat exchangers are up to five times more efficient than shell-and-tubes, making heat recovery profitable even where the energy sources traditionally have been deemed worthless.